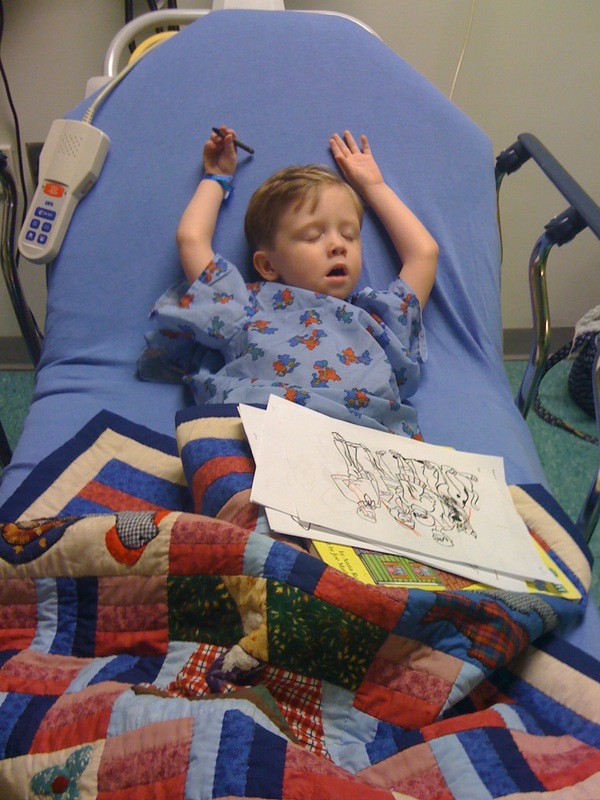 Having a Kiddo in the Hospital Is Harder than Hard! Hospitals are very much on my mind, because my husband Chuck is having his second knee replacement on Monday. We will be there very early in the morning because he is the first surgery of the day at 7 am. So consider your experiences in the hospital in your various capacities: being a patient; parent, child or spouse of a patient; chaplain; minister; or visitor. In what ways have you experienced your times in hospitals? Think of 5 ways and share your blog address in the comments section when you play. I remember being alone with a toddler and having been to the ER for two nights in a row because as a mom I knew something was wrong. And more than the heart burn that the dr diagnosed it as the first night. I had someone with me the first night but my husband was away as dean of Laurel Ridge so it wasn’t easy for him to get home either night or for the week that would come. But the second night I feel blessed in some ways because the doctor working on him had a aha type moment and tested his pancreatic enzyme levels. And yup that was the answer to the problem. My little guy had what we thought at the time Acute Pancreatitis. 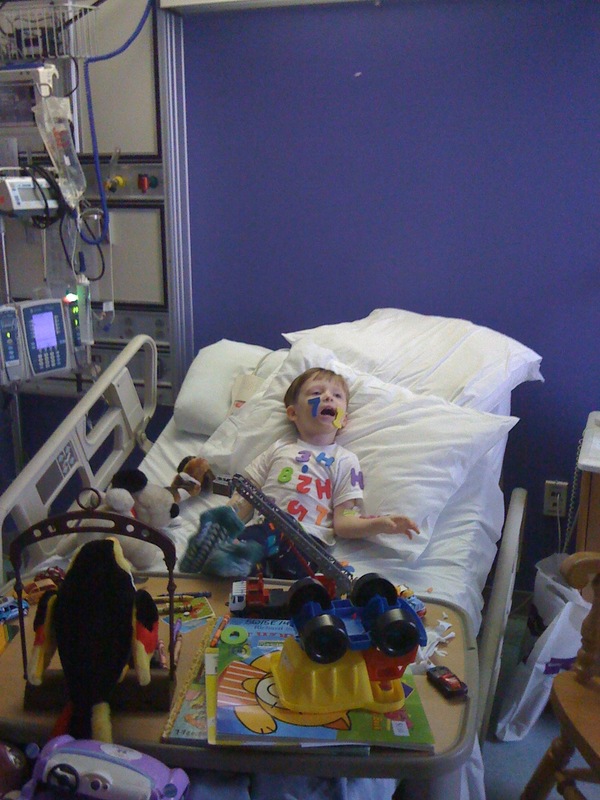 I remember that I was devastated when they told me he would be admitted for at least a week. As a pastor I knew that they don’t admit adults or children without it being a serious issue and I was scared for his life and didn’t know what to do at midnight alone with my very sick child. Thankfully my mother in law came down from Winston-Salem (a 5 hour drive) the next day to be with me and offer me some support. The whole thing brings tears to my eyes still. Because other than her, one friend, and daily or multiple times a day calls from my hubby (as cell service would allow) I had no support. No church members visited or offered to bring anything. I felt alone a lot and all I wanted to do was cry but knew that would only get my little man a little more worked up. I remember the nurse on the day we were leaving telling me that little ones that come in with numbers that high usually don’t leave. Meaning you guessed it they die. I’ve never forgot it and remember it every time that the doctors fear his pancreatitis is flaring because it’s not longer acute but chronic. 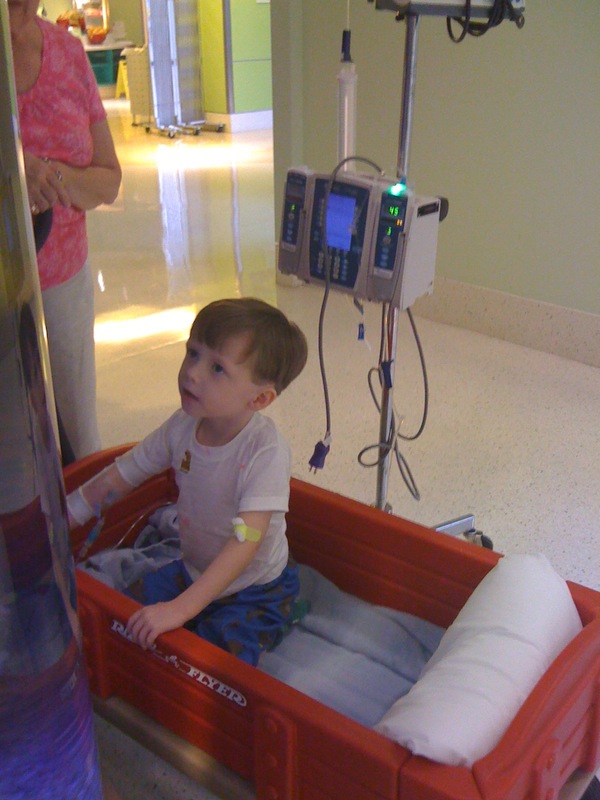 What parent wouldn’t be freaked out and exhausted from not getting much sleep ( sleeping in bed with their little one for a week) and wondering when he was going to start to feel better and when they would stop giving him morphine and give him real food. 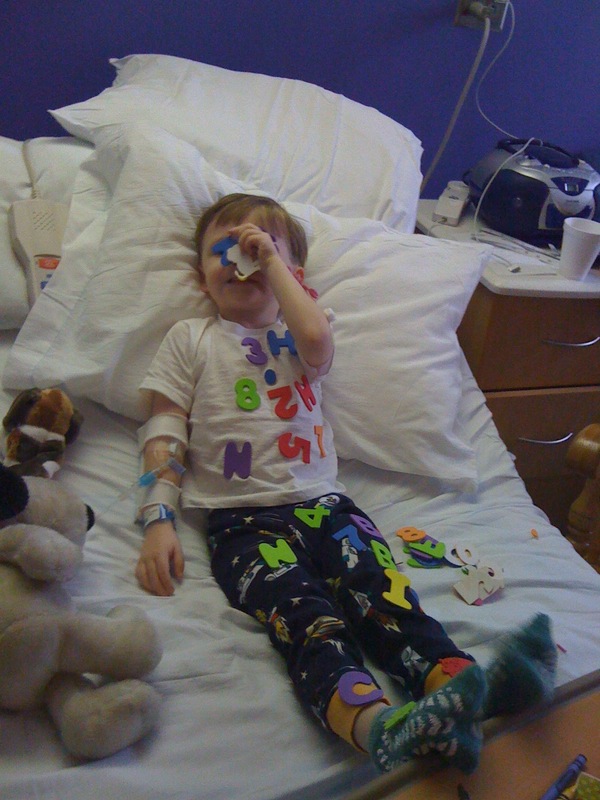 But as you can see from the pictures below he did get well and we did have some play time so to speak. Have a case of the Augusts? Not ready for the program year to start? Thinking about how you can’t save the world, or even your little corner of it? RevGals can’t fix it all either, but we can give you a reason to post to your blog! The #RallyRevGals Blog Contest will run from Tuesday, August 18, to Sunday, August 31. 3. Share the link in the comments on this blog post, in the comments on the accompanying Facebook group post, or on Twitter (be sure to use the hashtag so we can find your blog post). 4. Everyone who participates will be entered in a random drawing for three prizes from our Cafe Press store. I couldn’t narrow it down to just one woman who has helped me along in my 16 years of ministry, so over the next few days I will be blogging about a few more. But here’s today’s special woman who deserves to be upheld as someone who cared and countinues to care for me as a pastor and a person. In every church we’ve served I’ve found that there are a couple of lay people with whom I develop a special bond with. Usually that bond is strenghtened by their witness to me and their unconditional love and support of me as their pastor. It’s not that they wouldn’t be honest with me but perhaps it’s because they are honest – honest with constructive criticism and honest with compliments and words of encouragement. There was always a feeling I had that this person had my back and was praying for me. As I mentioned thankfully I’ve had this at every church that my husband and I have served but a few stand out. One of those is a lady named Peggy. Every Sunday Peggy and her children and grandchildren where in church I knew that I would be given a hug that would fill me with the energy and the joy that I would need to face whatever may come my way till we meet again. Along with that hug were words such as “I love you so much”, ” Your prayers are so special and sincere”, ” You have gifts for ministry and I’m glad your my pastor” etc. We all long to hear those words but we also recgonize that being ordained and thus behind the pulpit often set us apart from hearing those words that help sustain our beings. My bond with Peggy I believe is unbreakable. I haven’t been her pastor in close to 10 years but her family and my family still maintain contact (her daughter and son in law are our littleman’s Godparents) and in many ways I see her as an unofficial grandma to my littleman. I’ve sat with her through declining health of herself and her husband. After moving away I returned (within the boundaries set and with permission) to help officiate at her Granddaughters wedding, her husbands funeral and sadly her son’s funeral. It’s just not every day that you can do those things but when some people ask you know in your heart your meant to be there and woulnd’t be anywhere else. Peggy is a special lady and although she is now limited in the ways that she can serve I know that she serves a risen God with a servants heart. Every pastor should be blessed to have a Peggy in their life. Peggy has ralleyed around me and help me to remember at times why I do what I do and who it is that I serve. I’m so blessed to have her in my life! It’s hard for me to believe that today is the last day of being 40. Turning 41 seems like a bigger deal than turning 40. I guess because I feel as if I have been through a year of physical challenges and the emotional ones that go along with it and at some level hope this isn’t what all years will look like. But I’m taking this day to begin a New Years resolution of sorts – making changes in the way that I handle life around me. Some of those changes may be a bit scary and some of them come with a sense of relief. If I want to live another 40 years I know that it’s time to put into practice some of the very things that I tell those I pastor on a regular basis. It’s time to do some things that refresh me and allow my energy and God’s love and grace to flow throw me. During the past year my life seemingly fell apart, childhood trauma hit me again and this time as a flying brick coming out of no where. I wasn’t expecting it to rehaunt my life but it did and it forced me into a major depressive episode which led to new meds and a new therapist. It also was the leading cause in a medical leave of absence from the church I serve. One of the toughest things I had to do was to stop being a pastor to others and allow some to care for me. It wasn’t long after my return to work that I had a hysterectomy and appendectomy – another tough and emotional event. As my 40th year was drawing to a close I returned to Canada to officiate at my grandfather’s funeral. This proved to be a time filled with great blessing and a time of sadness as I learnt new things about my family of origin and yet was blessed with a reunion of sorts with my Aunt, Uncle,and cousins and got to meet an Aunt I’d never met. I hope that these new and reformed relationships will grow as time goes by. I celebrated my 16th year of ordination and thus faithful service to the Moravian Church – service to a God I love and a church I deeply appreciate and care for. So today I spent time not only looking back over the past year but more looking into the year that lies ahead. This morning I spent some time with my counselor and I can’t begin to emphasize how much of a life saver she was as I travelled through this past year (and I can’t help but say if you are considering getting a counselor – do it, it just might save your life too but at the very least it will enrich it). This afternoon I’ll spend some time learning about continued ways to serve the church and this evening will be topped off with some time of doing what I love to do most knitting! As I enter a new year of life I pray that I may more fully become the person that God created and continues to create and call me to be. I know that takes a commitment on my part to tend to myself – my whole self- body, spirit and mind. I make this commitment and look forward to watching the ways that will help me to grow. I look forward to creating more (hopefully finishing my first knitted sweater), coloring more, taking time to take more pictures and letting the spirit recreate and create a new in me. I certainly look forward to enhancing my ability to minister and going on my first cruise in February with other revgals. Lastly, I look forward to a more uplifting year filled with the peace and hope that comes when claimed as a child of God!